We are taking another lap around World Showcase today and stopping into Karamell-Küche for a couple of treats! Who can resist all of that buttery caramel? Super not me. It’s true. We rarely make it all the way Around the World without stopping for a sweet treat here. Stepping inside is like finally realizing your best candy store dream ever. You don’t have candy store dreams, you say? Well you will after you’ve been here. There are so many outrageously good things to try, and we always finds something new! 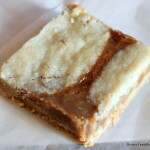 Recently, I told you about two other treats we tried here — the Caramel Bacon Square and Caramel S’more. Today, we’re back with two oldies but goodies to share! 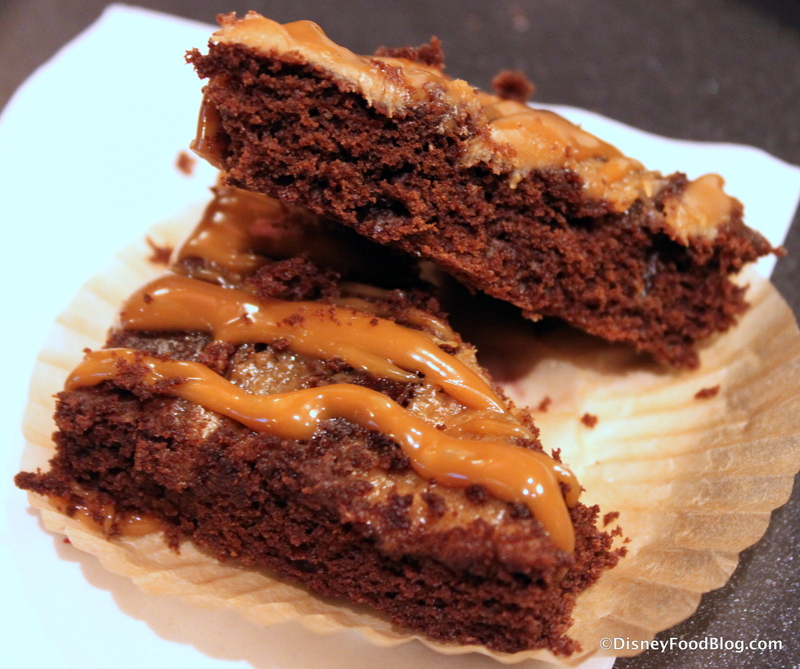 The first treat I want to show you is the Caramel Brownie. I was excited to finally try this one. I have no idea why I hadn’t indulged before. It’s drizzled heavily with that golden Werther’s Caramel, and that turned out to be the best part. The brownie itself was more cakey than fudgy, and it really didn’t have the moistness I was looking for. It was a little dry and crumbly in fact. This alone kind of ruined the treat for me, but that may have just been a bad batch. Look a little more closely, and you can see that, in addition to the drizzle, there’s caramel baked right into the top of the brownie! It’s like a double shot of golden, buttery sugar. If you like chocolate and caramel in more of a cake-like form, grab a glass of milk. This one’s for you. But I also had to try something for the candy lovers out there! And this time out, I chose the Caramel Toffee. 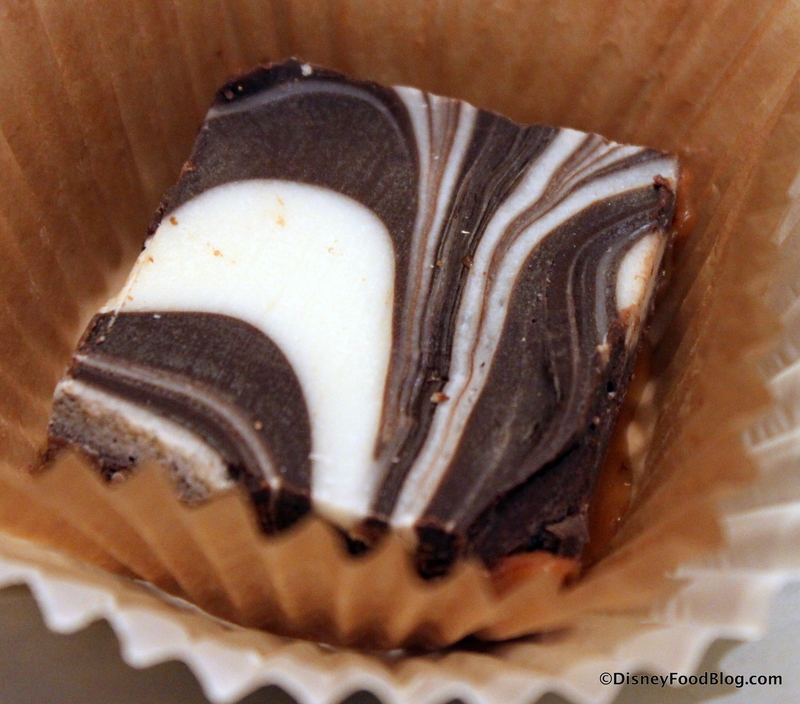 The marbleized detail on the top of the square really made it stand out from the sea of caramel and chocolate offerings in the case. A view from the side gives you a better idea of what you’ll be enjoying — a thick plate of that swirled Dark and White Chocolate sits atop straight Caramel. 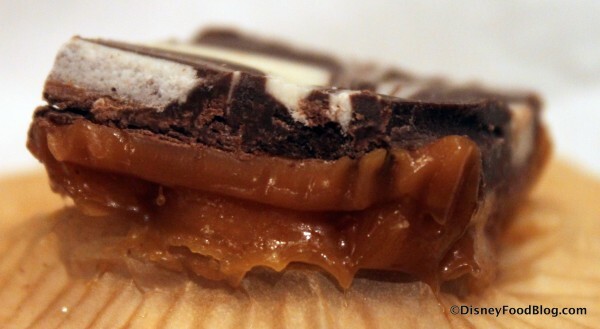 Flip the candy over and you see that the caramel base a little better, but there are actually two things happening here. 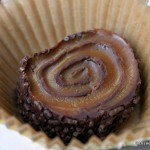 Not only are you getting the soft and chewy Werther’s caramel that you see in many other Karamell-Küche treats. 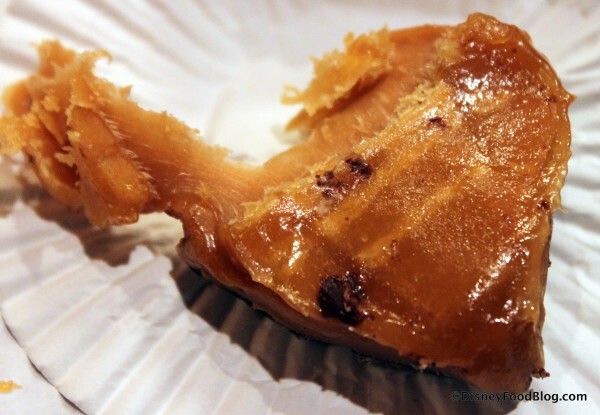 There’s also a layer of buttery, semi-hard toffee at the bottom. The two different consistencies make this candy truly something special. It was delicious, and, of course, super-sweet. It amazes me that with such a huge selection at Karamell-Küche, every single thing is distinct. At first glance, you may think that if you taste one treat here, you’ve tasted them all. But I suggest you do a little exploring to see all of the imaginative ways they’ve put caramel to good use. 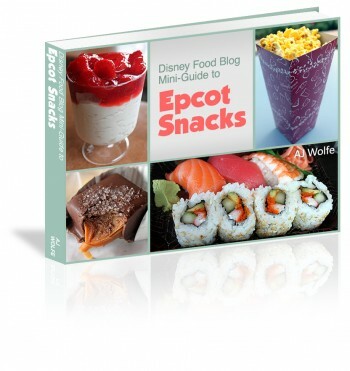 Snacks are kinda of a big deal at Disney! But we know that your dollars are precious, and you don’t want to waste time or money. And that’s where we can help! We’ve got all the info you need to get the biggest bang for your snack buck! 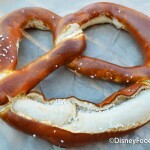 The DFB Guide to Epcot Snacks e-Book helps you to make the most out of your trip when it comes to your snack choices. And for a limited time, we’re thanking you for supporting this blog by offering the Guide for a $3 discount! To take advantage of this discount, use code Epcot2014 at check-out. 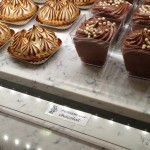 Which treat will top your list for your next visit to Karamell-Küche? Leave a comment and tell us what looks good to you! 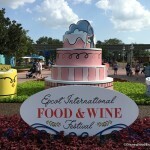 « Disney Food Pics of the Week: Turkey! Before you even said that the caramel brownie was dry I was thinking wow that brownie looks really dry. Finally made it to this place on our trip last month. How have I never been in there? Didn’t try these items, but I got the caramel shortbread that has been posted about here before. Pure heaven. 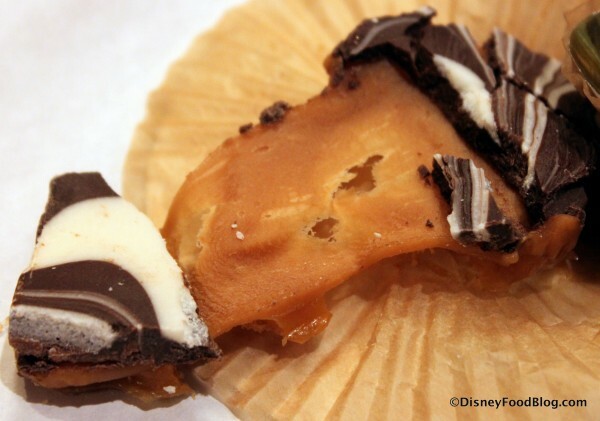 The caramel toffee sounds pretty amazing. I tried the brownie when I was at WDW three years ago and I remember it being so dry!!! 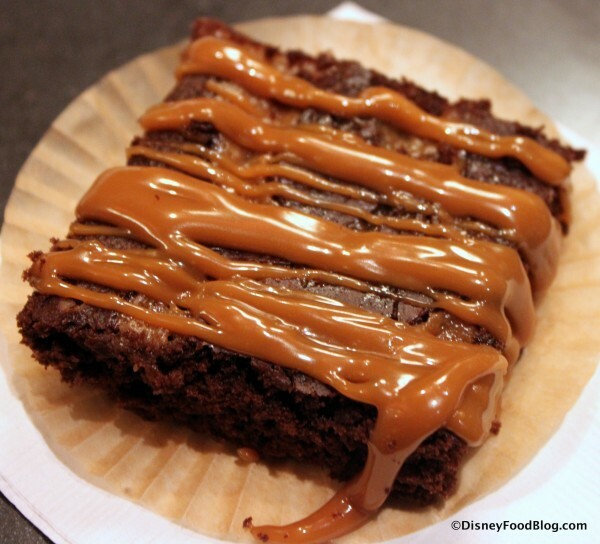 It amazed me how they could screw up a brownie, even the caramel on top couldn’t make up for the dissapointment. Let’s hope they change the recipe soon! That’s disappointing to hear about the brownie because it looks sooooo good! On our trip 2 years ago I waited until the last day to buy a couple caramels and ate them once I got home (then wished I’d bought way more of them because they were fabulous). We had that brownie a couple weeks ago and completely agree. It was so dry. Just wanted to mention that if you have an Annual Pass, they honor the 10% discount!